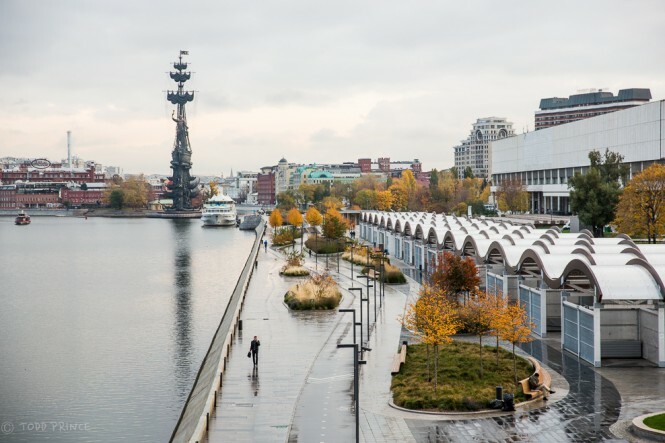 Krimsky Val, which runs along the Moscow River from Gorky Park toward the Kremlin, had a massive facelift about a year ago that turned it into a beautiful pedestrian hangout that is especially popular with Moscow youth. 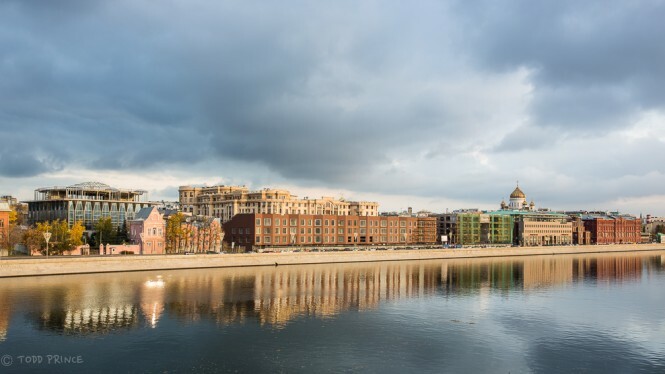 It has also become a perfect jogging spot for the growing number of morning Moscow runners and bikers. Just over a year ago, a run-down gas station stood on a road here, cars racing up and down. 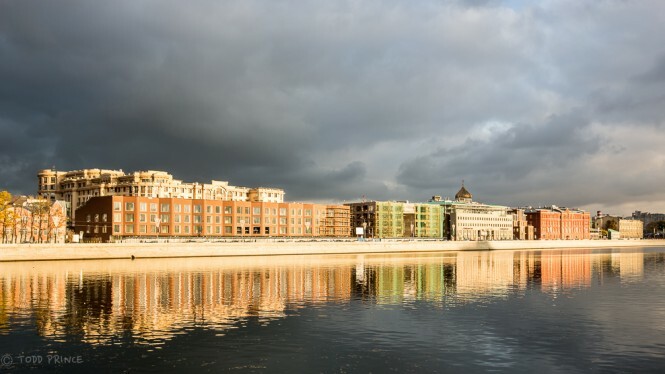 Krimsky Val sits opposite the so-called Golden Mile, where some of Moscow’s most expensive housing lies. Several objects are still being constructed as can be seen in the photos below. Active construction has been going on for a decade, transforming the area. A quick look at a realty website shows apartments going for between $17,000 and $50,000 a square meter along the Golden Mile. 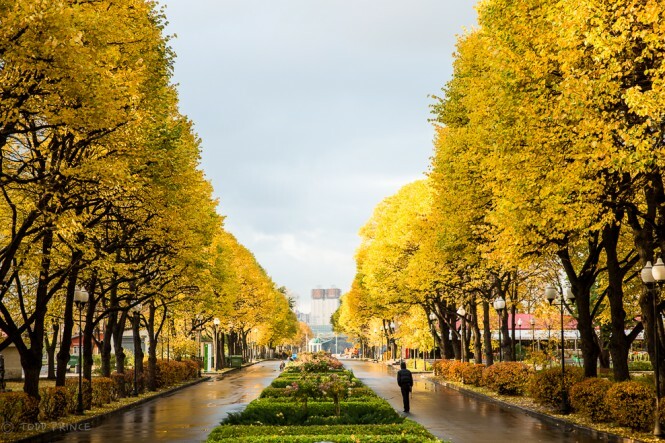 I took a stroll along Krimsky Val around sunrise on an October weekday, finding it pretty empty, except for a few city workers cleaning it, a handful of runners and bikers, a small Chinese delegation consisting of about 8 people and the occasional random stroller. Dark clouds fomenting rain were high in the sky, enabling the rising sun to throw sunshine onto the Golden Mile, turning it literally into a golden color for about a minute before the clouds covered it. I managed to get a few shots of nearby Gorky Park in all its autumn glory in the sunlight before the clouds took over. A lonely bench on Krimsky Val getting a few minutes of sunshine before the rains come. 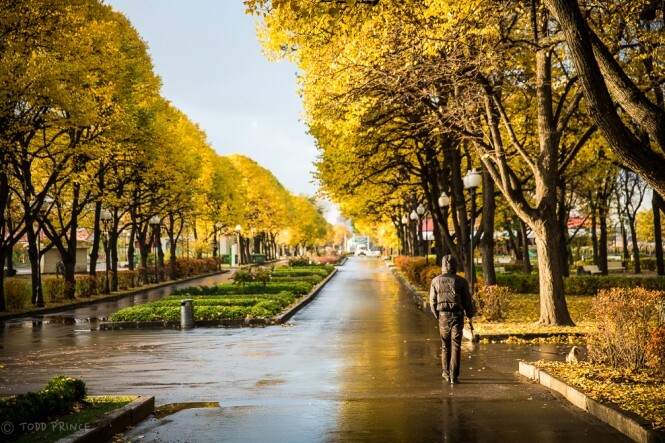 A man walking through an empty, but sun-filled Gorky Park at about 10am on a weekday. 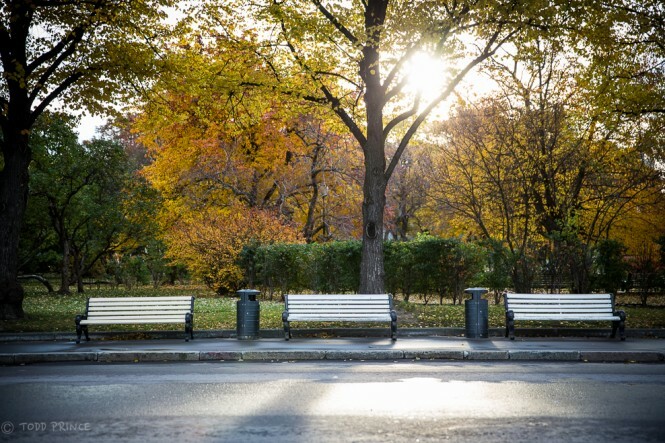 A tree-lined path in Gorky Park is light up by the sun. 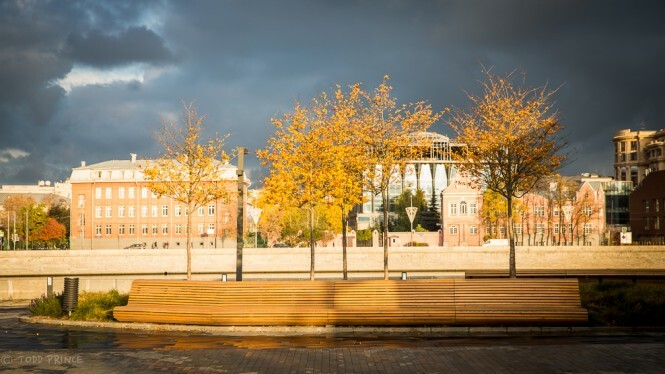 Benches await guests at Gorky Park….but they won’t come on this day as the rains overtook the skies. 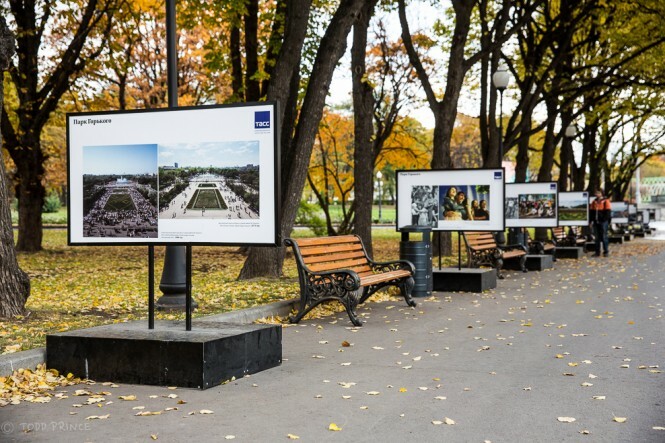 A visitor at Gorky Park taking in a photo exhibition as the leaves fall. 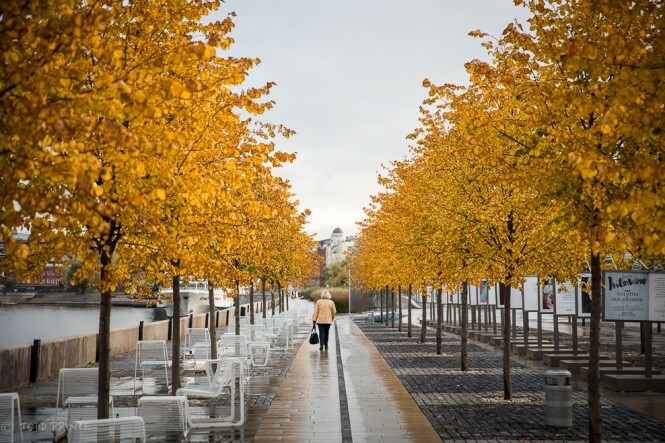 A businessman walking along Krimsky Val toward Gorky Park as a city worker reads a book during a pause. 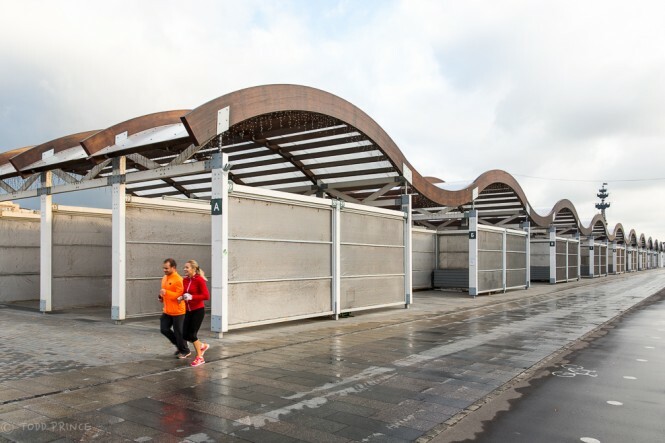 Build it and they will come….a few years ago, if you saw a jogger in Moscow, there was a very good chance it was a foreigner. With the development of pedestrian zones, the number of visible Russian joggers massively increased.